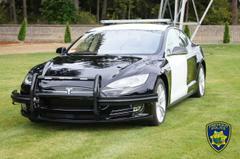 FREMONT, Calif. - January 23, 2019 — The Fremont Police Department will soon begin a pilot program to test a TESLA Model S 85 electric vehicle customized for patrol operations in alignment with the City of Fremont’s goal to reduce greenhouse gas emissions by 25 percent from its 2005 baseline through economically practical strategies by the year 2020. In 2017, the City formed a team comprising staff from the Police, Finance, Engineering, Information Technology, Building Maintenance, Fleet, Community Development, and Public Works Departments to study the feasibility of deploying a zero-emission vehicle for police field operations. The pilot team purchased a used 2014 TESLA Model S 85 in January 2018 for $61,478.50 (including taxes and fees) to replace a 2007 Dodge Charger which was scheduled to be taken out of service due to age. The Tesla is the only electric vehicle that met specifications for size, performance, battery range, and safety, all required for a fully deployable patrol vehicle. Tesla electric vehicles are manufactured locally in Fremont. Since purchasing the vehicle, the Police Department has been working with vendors to install the standard police equipment such as the light bar, push bumper, and ballistic barriers. The total invoiced costs for modifications to date are $4,447 and are expected to increase as final invoices come in. In comparison, a Ford Explorer with the police package costs approximately $40,000 with additional modification costs that are comparable to the Tesla. 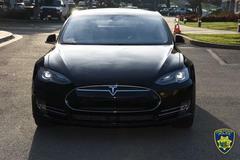 The initial buildup cost of the Tesla is slightly higher than that of a Ford due to the necessary customizations. In addition, the cost of gas over a five-year period for the police Ford Explorer is approximately $32,000, and maintenance is estimated at $15,000. While the average life cycle of a police vehicle is approximately five years, electric vehicles may be operational for longer due to less mechanical issues. To support plug-in vehicles, the City’s Police Complex has 872 kW of solar carport structures installed onsite and three charging stations. The electricity supply coming from the Police Department’s renewable solar power structure means that each Police fleet vehicle replaced with an electric vehicle will completely zero out the greenhouse gas emissions associated with that vehicle’s operation. The City’s pilot program team will monitor performance, durability, range, costs, and unknowns that will only be fully understood once the pilot test is completed and the results are evaluated. Once the vehicle is fully operational and deployed on patrol, the City will share more photos and information after the deployment and give our community the opportunity to get an up-close view of the vehicle. For more information about the Tesla pilot project, visit www.fremontpolice.org/ElectricVehicle.